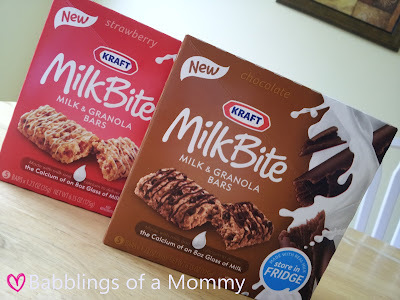 Babblings of a Mommy: NEW Kraft MilkBite: A Snack I Literally Can't Stop Eating! NEW Kraft MilkBite: A Snack I Literally Can't Stop Eating! A few days ago I was introduced to Kraft's New MilkBite and I can't stop eating them - they're so good!! It's a new form of granola bar that contains real milk and whole grain granola so it needs to be refrigerated. I know what you're thinking - Granola bars? That's nothing new - but these bars so rich and creamy, they're absolutely delicious! They even contain the same amount of calcium as an 8oz glass of milk! I love taking them when I'm heading out the door - so quick and easy and leave you feeling completely satisfied. The chocolate is definitely my favorite, but there's also strawberry, oatmeal raisin, peanut butter, and mixed berry for you non-chocolate lovers. Even my daughter has gotten in on the action and loves having MilkBite's for a mid-day snack. How great is that?! Have you given them a try yet? UPDATE: Publix has an exclusive coupon you can download by signing up with Cooking With Kraft, or you can also use this $1 off manufacturer coupon available. I haven't tried them yet, but they sound delicious. I will definitely be on the look out for a coupon or sale so I can try them. Thanks for the great review. Hi Brenda, I've included a coupon you can use on your next shopping trip! Thanks for leaving a comment. Thanks, Jenny! I missed the coupon the first time, but I just printed it now.